Imagine hiking to not one, but two of the world’s most dangerous places. Well, if you are game enough and feel like you need an adrenaline rush, picture yourself hiking up to Ol Doinyo Lengai and Mount Nyiragongo – two of East Africa’s most mesmerisingly beautiful active volcanoes. Not for the faint hearted. Ol Doinyo Lengai or ‘The Mountain of God’ in the Maasai language is the only active volcano known to erupt carbonatite lava. This volcano is located in the Ngorongoro District of northern Tanzania and is considered one of Africa’s natural wonders. Its temperatures reach about 500-600 degrees Celsius compared to temperatures of over 1100 degrees Celsius for basaltic lavas. Lengai’s lava does not emit enough light to glow during the day, but is still a spectacle to behold. Geologically speaking, the present-day cone of the volcano was constructed about 15,000 years ago. Since the mid 1980’s, Lengai has become recognised in the tourism industry due to the documentation of the unique natrocarbonatite lava. At first it was a hot property in the research community, but has recently become more frequently climbed as more and more people have become curious about the world’s strangest volcano. The ascent of Ol Doinyo Lengai is demanding on account of the day time heat, lack of water, steep and unstable slopes of ash and crumbly rocks. A very early morning 1:00 a.m. drive to the base of the Ol Doinyo Lengai Mountain is where you begin and you typically should reach the summit by sunrise. 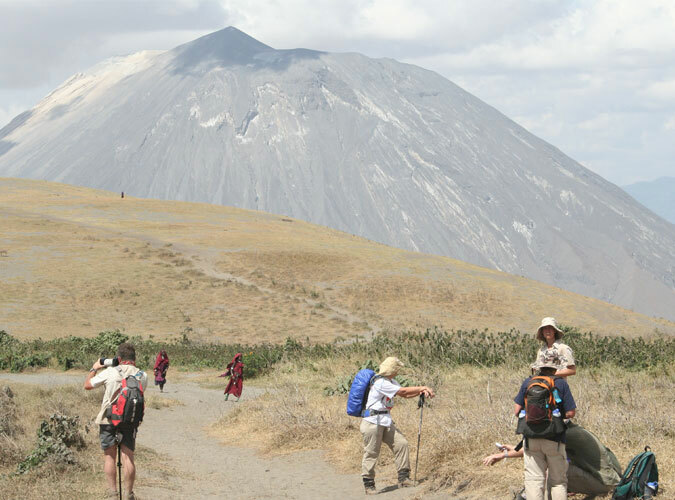 With the choice of two different packages; Sacred Places of the Masai and Tanzania Ngorongoro Walking Safari trips you will have the option to climb this extraordinary volcano and explore the astoundingly surreal views. Mount Nyiragongo is a stratovolcano in the Democratic Republic of the Congo, famous for its persistent volcanic activity and has the world’s largest lava lake in its huge crater. It’s situated in the Virunga mountains (which includes eight volcanic edifices) located inside Virunga National Park, about 20km north of the town of Goma and Lake Kivu -and just west of the border with Rwanda. It has been erupting since 1882 and since then has erupted 34 times, including many periods where activity was continuous for years at a time. Nyiragongo volcano is infamous for its destructive behaviour and extremely fluid lava that runs like water when the lava lake drains – but this doesn’t stop climbers from climbing Mount Nyiragongo when the lake returns to normal again. Climbers are able to observe the bubbling lava cauldron from a safe distance of course, where the heat and smell of sulphur remind you that there’s still a lot of activity going on beneath the scalding surface. They also get to have the experience of a lifetime by enjoying this beauty in the dark, dawn and dusk. The hike includes full board, but we suggest bringing some money to tip your cook and porters. You’ll have small huts to stay in all the way up this tough two-day hike and the hike is generally friendly for people of all levels of fitness. Wild Frontiers can tailor make a trip to almost anywhere in East Africa – email reservations@wildfrontiers.com to speak to safari designer today!